Cover illustration of Preserving on Paper: Seventeenth-Century Englishwomen’s Receipt Books. University of Toronto Press, 2017. I have long been interested in food and language and the relationship between the two. The most obvious link is, of course, the recipe, but in my own postsecondary education, I always felt somewhat dissatisfied by the scholarship (or lack thereof) I encountered on these. As a student of science and then of English, I noticed that recipes were either overlooked or disparaged in the courses I took. None of my biology teachers mentioned the role the recipe might have played in the formation of the scientific method (nor did they talk much about the historical context of science at all). And in my English courses, recipes, if considered, were regarded as a non-serious genre that could never be sufficiently contorted to fit literary expectations. Few academics at the time, it seemed, gave recipes much thought and no one seemed to know quite what to do with them. And I kept having this niggling feeling that we were missing something important. During a graduate research trip to the Folger Shakespeare Library, I accidentally called up a seventeenth-century receipt book. Serendipity! Holding the manuscript in my hands, I felt reverence…and also confusion. 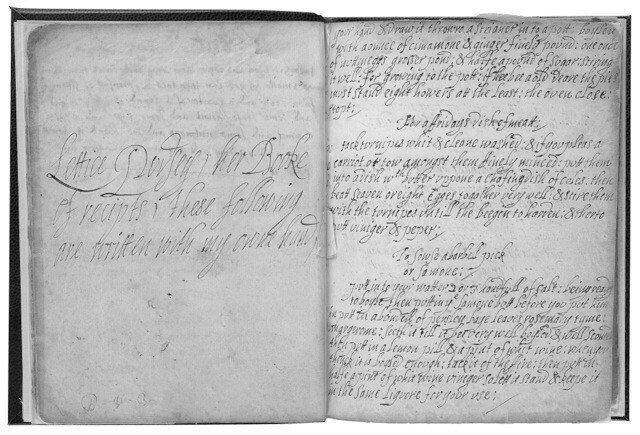 I had no paleographical training, so struggled with the recipes themselves, but it was clear there were many different forms of handwriting. Why so many? What explained all the marginal notes and attributions? Who was the author? Weren’t only a few women literate at the time? And what did the manuscripts say about the women themselves? Folger MS V.a.450, fols. 7v-8r. Credit: Folger Shakespeare Library, Washington, D.C. I ultimately decided to focus on these manuscripts and their relationship to the women who wrote them for my doctoral dissertation (finally, a clear topic! ), and I began an archaeological-like digging into the past to try to answer my questions above. 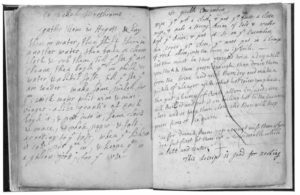 And finally, I stumbled upon the deep and diverse research happening by many scholars on recipes–including the same scholars who contribute to The Recipes Project. I learned how to read seventeenth-century handwriting. 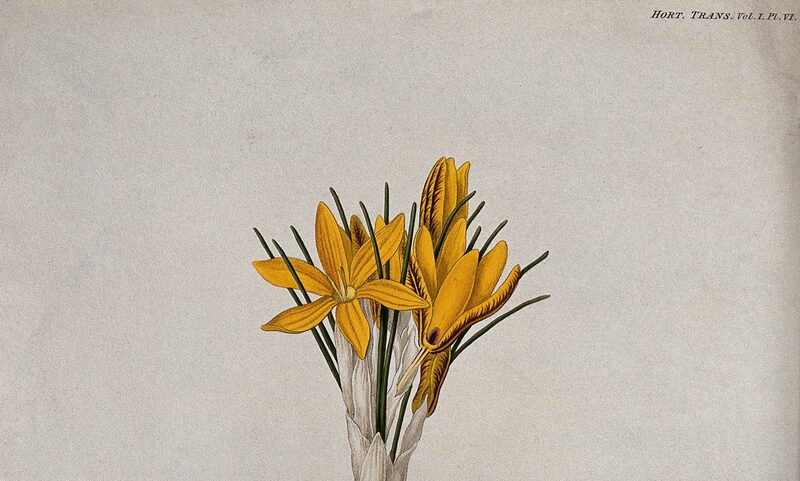 I read all kinds of helpful texts on the history of women’s literacy and physical work, on seventeenth-century food and farming, on Galenic understanding of human health and the virtues of plants, on kitchen tools and architecture. Gradually, I began to piece together a better understanding of the period and of women’s work and writing within it. I completed and defended my dissertation and felt confident about my knowledge in this field of early women’s writing in English. 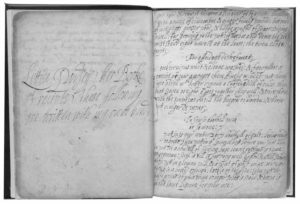 However, six months after I had successfully defended my dissertation and was teaching an undergraduate course on the history of the book, I was struck by an idea that changed my entire understanding of these manuscripts and of the recipe itself. We were discussing Michel Foucault’s “What is an Author?” and I realized that my own modern assumptions about authorship and subjectivity and “literary” writing had led me, and many others, to miss the point entirely. 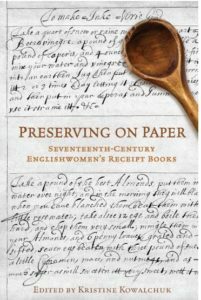 Receipt books did not reflect women’s oppression, nor, conversely, did they reflect the rise of modern subjectivity, because women were, until the seventeenth century, already the respected authorities on food and medicine. Furthermore, they were collective keepers of this knowledge, rather than individual authors or owners. It is this culture, so very different than our own, that is preserved in receipt books – meaning they reflect an end of women’s wider authority rather than a beginning. Patriarchal values of dominion over nature, individualism, and capitalism arose as new, male-dominated professions – chefs, doctors, and apothecaries – assumed individual authority over women’s collective knowledge and dismissed, ridiculed, and persecuted the women who persisted with special knowledge in food and medicine. This is the history of the modern cultural view, and our inheritance of it today has caused most of us (including Foucault, who saw the “postauthor utopia” as occurring only in the future, not the past) to largely forget what came before, so that we have been complicit in the continued dismissal of, rather than pride in, both women’s traditional work and the not-so-humble recipe as the material form of this authority. Folger MS V.a.450, fols. 55v-56r. Credit: Folger Shakespeare Library, Washington, D.C.
Our modern cultural outlook means we give Francis Bacon credit for creating the scientific method, even though women were cooking and curing at home long before men were performing experiments in labs (and many of us continue to believe that we might be objective observers of nature in the first place). This culture regards traditional knowledge and household work as less valuable than academic knowledge and professional work. It marginalizes midwives and home care workers and mothers who breastfeed. It rewards celebrity chefs who collect traditional and “country” recipes and sell them in cookbooks under their own name. It subscribes to the cult of the single author. It regards recipes as unimportant. And it sees women’s traditional work as repressive, rather than recognizing its role governing the most critical cultural knowledge. I also can’t help but see how our cultural amnesia connects to current events related to women’s rights. To understand women’s struggles today, we need to look back and try to understand their origins. It is past time for all of us to deeply consider the particular historical construction of authority in the west, and to recognize that it once looked very different. A recipe for sugar puffs, say, or a remedy for an itch, might at first seem frivolous, but they are in fact windows into a world in which women’s collective authority was assumed. This is a really good post, very thought-provoking. I’ve never thought of the obvious scientific nature of testing and improving on recipes. This is such a great article – thank you for posting it! This such an excellent article, highlighting also the hidden or Insufficiently acknowledged authority of women. Domestic economics / home economics / household science are also under researched and undervalued in the historic feminist professional and educative context. My phd a few years back looked at the more recent conceptual development of the field in higher education in the Uk . As I have now more liberty to look back at how this “acceptable science for women” developed I would love to correspond with others who have an interest in the area. 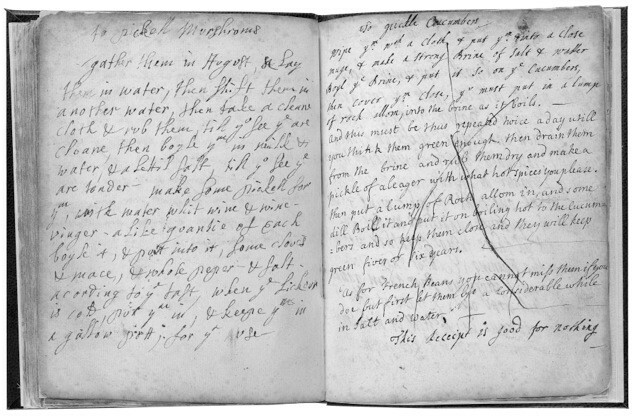 Recipes and their historic transformation, interpretation and performance are a fascinating area . Love your point of view! It is indeed history worth remembering. And past time to stop the repression rhetoric about women in the kitchen and home. I feel most feminist, privileged and happy when in my kitchen.